Why does she need to be president to talk to white people? I'm confident all the major news outlets would give her unlimited air time to talk to white people today. If for some odd reason this talk only works with President Cred, I do believe President Obama has been very willing to stump for her; I'm also very confident he would be willing to stand with her when she has this talk with white people. The streets are burning right now! ... this can't wait for January to role around. She needs to talk to white people right now and start putting an end to this madness. Why is she waiting? It would be unscrupulous for her to hold off on this talk just to win an election. We must all demand better from the people who we have lead us. She must have this talk tonight! Whilst pandering to a black interviewer, Hillary Clinton says she is going to tackle shootings of black people by law enforcement by speaking to 'white people'. So wrong on many levels. 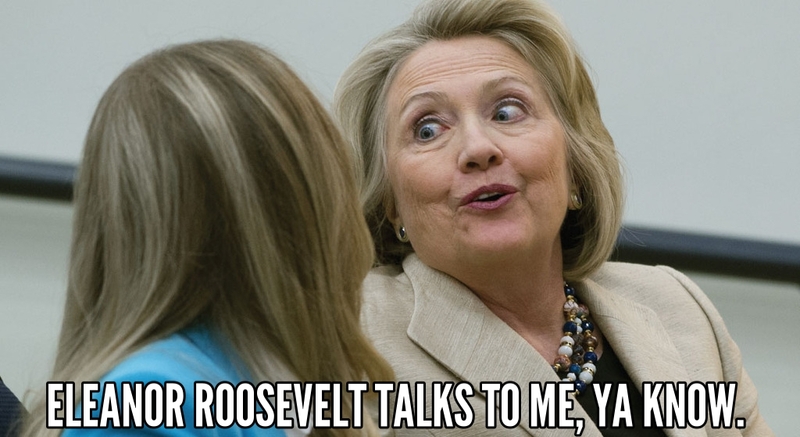 Lets not forget Hillary can also talk to Eleanor Roosevelt.... not just white people. They are quite the pair, I hear. I haven't heard a word about her "speaking to white people", even on Fox news. The memes are coming out now, ATS really has hit the bottom in terms of intelligent discussions. Meh, I made the months ago. Seriously tho, I haven't heard this mentioned yet anywhere but here. I heard it with my own ears too. Hannity should be all over it tomorrow. If Hillary ever does a press conference with real questions, perhaps she should say what she meant. Maybe she could do an interview with Hannity - like Trump does interviews with bias pundits... won't hold my breath though. She could start by naming the white people she is going to talk to in order to sort out the riots in NC. makes me laugh that she said "if she gets elected" - becasue your lives dont care otherwise. So what is she trying to say, it is white peoples fault? White people get shot too. She should talk to black people about that, maybe. In fact...more white people get shot. The last number I saw was only 24% of police shootings are related to black people. Which once you consider the percentage of the populous, the higher amount of black vs white crime (percentage wise) and the amount of police calls into areas with a higher percentage of black people...that number is pretty much average and correct. In other words...it is exactly in proportion to everyone else. Police shootings are actually skewed towards white people when you consider crime rates and population by race. There are mistakes made, of course, but there is no racial bias in the numbers at least. On this day there were also 2 other fatal shootings by police, where the victims race has not been released. 1 in Colorado and another in Connecticut. None of these deaths were hyped by the media.